Old computers tend to lead sedentary lives. Parked in shelves and closets, maybe touched by the occasional dusting; the lucky ones still run old games from time to time. But sometimes one becomes a sensation. The Twiggy Macintosh is a prototype Macintosh 128k that used a 5.25-inch disk drive. Long thought lost to history, two of these primordial Macinti were recently resurrected and returned to life in full working glory. 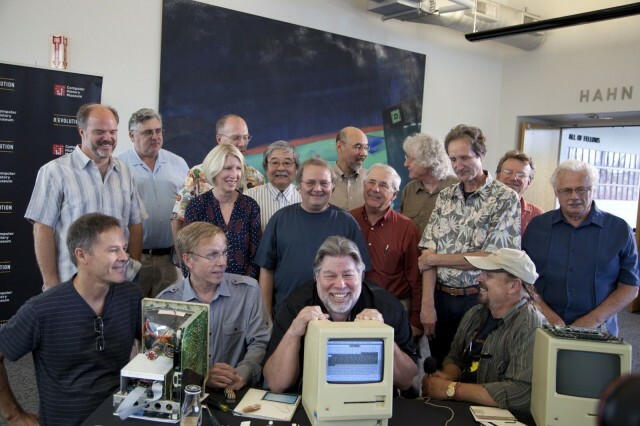 Their rebirth brought about a rare reunion of the original Macintosh design team. And one of them recently repaid the effort by fetching about $40,000 at an auction. 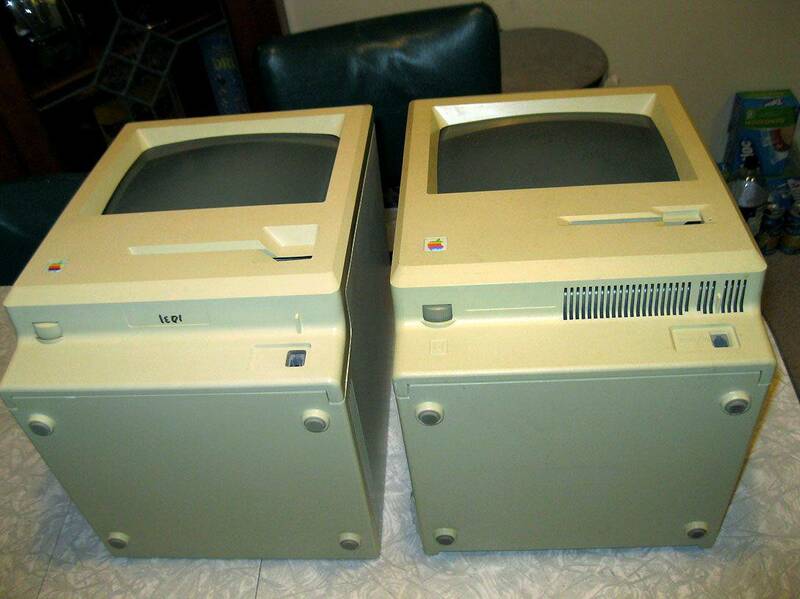 They are — without a doubt — the oldest working Macs in the world. Here is the story of their amazing journey. 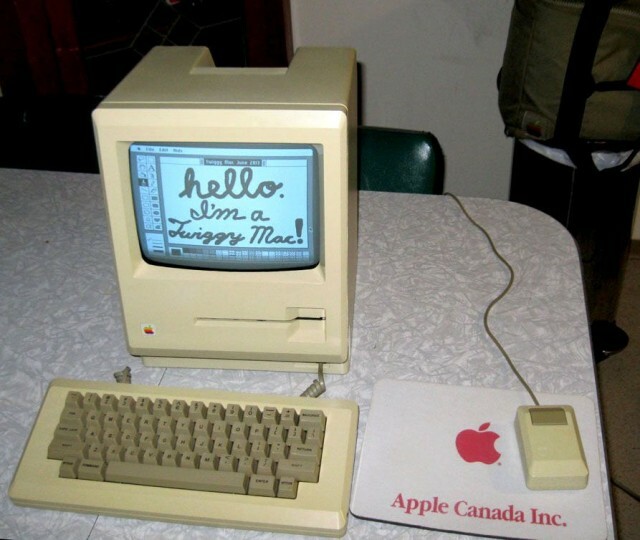 When the Macintosh was introduced by Apple in 1984, the diminutive all-in-one computer came with a 9-inch screen and a 3.5-inch floppy disk drive. Many of these revolutionary machines survive to this day. But before this Mac came a slightly different design that used an unreliable floppy disk drive. Many of the drives didn’t work and manufacturing yields were low. These snafus nearly derailed the Lisa, which began shipping to customers in June 1983. Panic began to set in when everyone realized the dodgy disk drives weren’t going to be reliable enough, and unlike the Lisa, the Mac didn’t have a hard drive to fall back on. After many tortuous rounds, even Steve Jobs finally acknowledged reality and gave up on the Twiggy drive. Apple had recently gotten a demo of a 3.5-inch disk drive from Sony. It worked at the same data rate as the Twiggy, and the disks had a hard plastic shell. When Jobs saw the drive he loved it and immediately wanted to adapt it for the Mac. That process proved too tortuous — see the Folklore.org story “Quick, Hide In This Closet!” for the entertaining details — but in the end, things worked out and the Mac shipped with the familiar 3.5-inch disk drive we all now know and love. Only a few Twiggy Mac prototypes were made. In true Jobsian fashion, all Mac prototypes at Apple that featured the failed floppy were ordered destroyed, and the Twiggy Mac was consigned to the dustbin of history. Until recently, it was thought that none survived. The story ended there for nearly three decades. Then in January 2012, a Twiggy Mac resurfaced. Photos of the rare prototype were posted on Apple-centric website Applefritter, generating buzz. How did this Mac survive? Was this the only one? The owner of the machine, posting as “mactwiggy” and known publicly only as Jay, said at the time that he bought the system after seeing it advertised online. Throughout the past 15 years, I have heard stories of the fabled ‘Twiggy Macintosh’ computer. It was a thing of myth and legend — like a unicorn. It was major find — truly a Mac collector’s dream. To Adam Goolevitch, a vintage Apple collector from British Columbia, Canada, this prototype proved irresistible. He contacted the owner and, after some negotiating, purchased the system. Goolevitch gave it a cosmetic clean-up and the system powered on, but he could not locate any Twiggy Mac software to boot the computer. With Apple 1 systems selling for hundreds of thousand dollars, he decided to try his luck on eBay, and listed the system for $100,000. “To my surprise, there was an overwhelming amount of media attention,” Goolevitch said. “Cult of Mac picked up the story initially, stating that ‘it looks like Woz is cleaning out his closet. '” Soon other media outlets, including Mashable, The Verge and The Huffington Post, were asking for interviews about the auction. Meanwhile, news of Goolevitch’s Twiggy Mac was percolating worldwide, eventually reaching Gabreal Franklin. Franklin was a former Mac software developer and president of Encore Systems, a company started by Randy Wigginton (Apple Employee No. 6), Ed Ruder and Don Breuner. They created the program that would eventually become MacWrite. Now Franklin worked as a filmmaker. He also happened be the owner of a certain Apple relic left over from his time at Encore — a Twiggy Mac seemingly identical to the one making waves online. 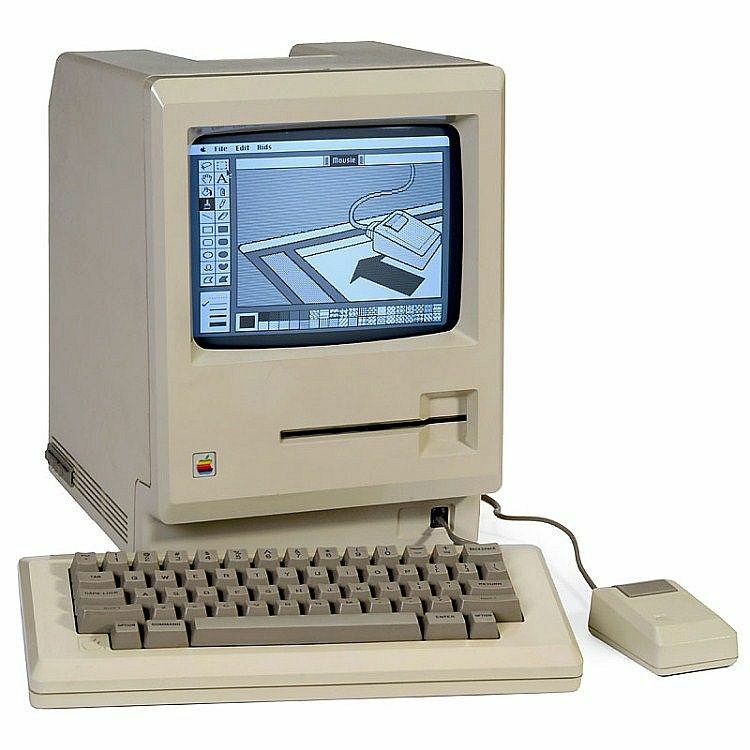 Franklin told his friends he was on location, and asked if one of them would contact Goolevitch about the Mac prototype. “As far as I knew, my old prototype Twiggy Mac was still somewhere in storage,” Franklin said. Franklin had come into his rare Mac when Encore shut down. Between Goolevitch and Franklin, there were now two confirmed Twiggy Mac prototypes in the wild. Clearly, Apple did not have the same fastidious level of paranoid secrecy in 1984 as it does today. The seed had been planted for a Twiggy reunion. When Franklin returned to the United States, he contacted Goolevitch and the two quickly decided to collaborate on getting the old Macs working. Working in Canada, Goolevitch could not get the disks from Franklin’s system to boot up his machine. They decided to get together and work on both systems together at Franklin’s home in California. When the first Twiggy disk was introduced, to our amazement and surprise, the Twiggy Mac booted right up! It was now 2:30 a.m. and both were exhausted. Work continued the next day. Swapping chips a few at a time, they identified the problems with Franklin’s system and cannibalized replacement parts from a sacrificial Mac 512k. Then using the now-shared compatible set of ROMs, they got the second Twiggy working. 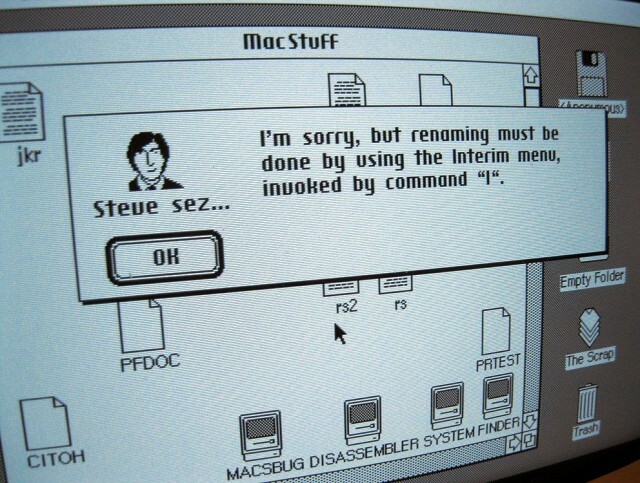 The “Steve sez…” dialog boxes are an added bonus! Goolevitch and Franklin wanted to reveal their prized possessions to the world during an appropriate vintage Apple moment. Up to this point, their resurrection efforts had been private. The release of the Steve Jobs biopic film Jobs in August 2013 — which delved into the early years of Apple and brought to life the development of the Lisa and Macintosh computers — felt like that moment. 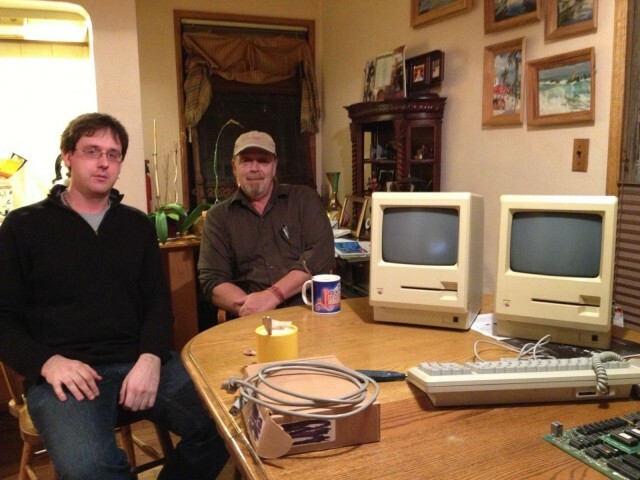 The oldest working Macs in the world then did one more insanely great thing: they brought together their creators three decades after birth. Goolevitch and Franklin published the resurrection details on the day before the movie’s opening. Reception was very positive, with the story attracting feedback from vintage computer enthusiasts worldwide. The movie itself did not fare as well with critics. A private party at the Computer History Museum in Mountain View, CA in September 2013 helped bridge the years. The event was coordinated by Franklin and Dan Kottke, one of the original Mac team members. It was a somewhat impromptu gathering but the RSVP list grew rapidly. Attendees, many of whom held Apple badge numbers in the single or double digits, included (among others) Kottke, Steve Wozniak, Andy Hertzfeld, Chris Espinosa, Guy Kawasaki, Jerry Manock, Terry Oyama, Larry and Patti Kenyon, Rod Holt, Randy Wigginton and Wendell Sander. Terry Oyama, on the Mac industrial design team, offered an example of the design sensibility that Jobs demanded and which lives on at Apple to this day. “If you feel the edge of the Mac, there is a textured surface on the side that makes it easy to find the on/off switch in the rear. Steve gave us the time to make it better,” he said. But what really made this event uniquely special is that few such gatherings had ever taken place before. Goolevitch (who also attended) told Cult of Mac this was the first reunion many of the Mac team members ever had with their former Apple colleagues. Meanwhile the market for vintage Apple collectibles continued to grow, and auction prices for the Apple 1 had reached as high as $671,000. With his Twiggy Mac now fully working and restored, Goolevitch decided to put his system up for sale again. Not on eBay this time, but rather with Auction Team Breker in Germany, who specialized in vintage technology sales. The opening price was set to €25,000 ($33,725). Along with the computer Goolevitch included Twiggy diskettes with early versions of MacPaint and MacAuthor running on pre-release versions of the Macintosh operating system. Also included was a letter of authenticity by Dan Kottke, and a keyboard tray with slide-out instruction card (like the Lisa used) which never made it into production. The wait for November began. Another working Apple 1 system was included in the same auction. Pre-event expectations were high. No Twiggy Macintosh prototype had ever gone up for auction before. Could the Twiggy Mac actually top an Apple 1 in price? At the auction, mixed results. The Apple 1 initially failed to sell. This was a working system from the original batch of 50 that Jobs and Woz sold to the Byte Shop in 1976. The unit was numbered 46 and included the original operation manuals, software cassettes and shipping box with a signature from Woz. It was listed for €180,000 ($242,820) and did not receive any bids, but ultimately sold for €246,000 ($330,000) after bidding on the item had closed. According to the auction house, two potential buyers were surprised that there were no bids at all and made followup offers. In the end, the Twiggy Mac did sell, for the hammer price of €25,000 ($33,725) and final price (after VAT and aution premium) of €30,750 (US$41,200). The Twiggy Mac didn’t top an Apple 1 in price, but Goolevitch was still sanguine about the results.